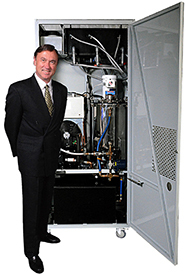 The Ferrator is the first patented, on-site Ferrate reactor for municipal and industrial applications. 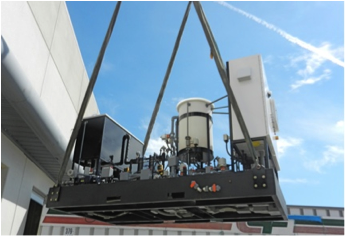 With this breakthrough of small, inexpensive, transportable on-site synthesis reactors, Ferrate can now be delivered continuously for chemical, industrial, and environmental treatment processes in commercially significant quantities. 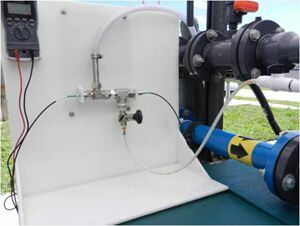 The Ferrator is made from off-the-shelf parts, can be scaled for any application, and pumps a liquid ferrate product directly into treatment process streams. The Ferrator has a small footprint. It can be skid-mounted and shipped by air or truck to any location or facility. The Ferrator easily retrofits into existing plant infrastructure by piping to and from a self-contained unit. Historically, at over $20/lb, Ferrate had been just too expensive for bulk industrial use. Before FTT invented and patented an on-site synthesis process, no one had ever manufactured Ferrate in commercial quantities at a reasonable price. Synthesizing Ferrate on-site eliminates product handling and transport and reduces the traditional cost of manufacturing a Ferrate product by over 90%. Prior schemes tried to manufacture a dry, stable, powdered Ferrate product in a central plant which then had to be packaged in hermetically sealed containers to keep it from contacting air or water while it was transported to the site of use. Ferrators now make it possible to commercialize a highly reactive, Ferrate treatment product. By synthesizing Ferrate proximal to the site of its use, the Ferrator eliminates all central-station manufacturing, transportation, distribution and product handling costs. Because our product is a liquid instead of a solid, it can be easily pumped and injected into standard industrial treatment processes. 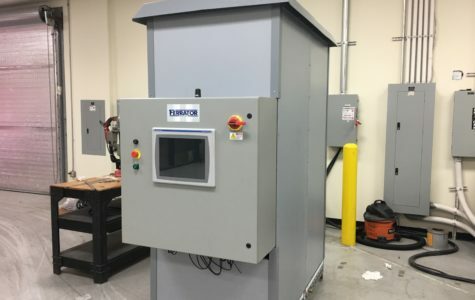 Most importantly, the Ferrator utilizes cheap, commodity-chemical feedstocks (caustic, bleach, ferric chloride) already found at most treatment plants. 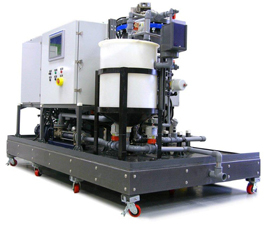 Substantial improvements in manufacturing economics enhance Ferrate’s potential for multiple applications in treating drinking, ballast, municipal, and industrial wastewaters and associated sludges and biosolids. 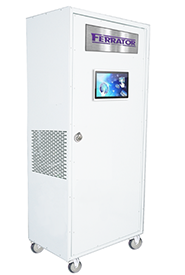 – Is environmentally friendly and powerful enough to meet escalating treatment demands. – Is cost-effective to operate and maintain. – Can be synthesized from commodity feedstocks. – Utilizes existing plant infrastructure and plugs into existing treatment processes. – Is highly scalable, modular and easy to retrofit and implement. – Requires a small footprint; critical for landlocked treatment facilities. – Requires minimal incremental capital investment compared to UV or Ozone. *Assumes a 1ppm Dose of Ferrate. Ferrator systems can be scaled to treat any treatment flow. 4 to 20 milliamp output: PLC Control. of Ferrate in the stream being dosed. 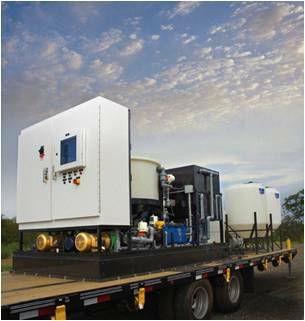 Ideal For: Treating Combined Storm Overflows or variable water quality.